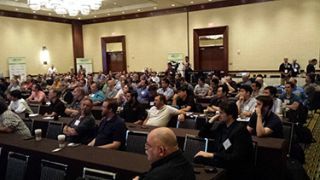 Nearly 250 consultants, integrators, sound engineers and IT managers from all over the world came together in Las Vegas on June 17, 2014 for the AV Networking World Conference to learn about Dante, the audio networking solution. This year’s event was had hefty sponsor list, including Atlas Sound, Attero Tech, Audinate, BSS Audio by Harman, Bosch, Bose Professional Systems, Focusrite Rednet, Innovative Electronic Designs, TC Group, Lectrosonics, Peavey Commercial Audio, Powersoft, Presonus, Shure, Stewart Audio, Studio Technologies, and Yamaha Commercial Audio. One new and popular component of this year’s seminar was the Dante Installation Workshop, in which three teams from the audience were tasked to design and put together a working Dante network using at least 5 different Dante enabled products. In just 2-3 minutes the teams were able to quickly install and configure a Dante system and transmit audio.